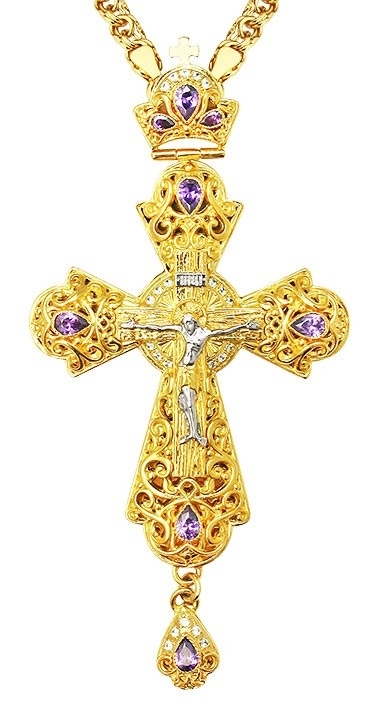 Pectoral cross - A131LP - Istok Church Supplies Corp. Orthodox Christian clergy pectoral cross of a small size of a classical form is made of brass and covered with 24K gold-gilding, galvanized. The crucifix is casted, volumetric, accentuated by fragmentary silvering. The casting volumetric decor, framing the Crucifixion, is decorated with excellent quality cubic zirconia. The stones are fixed by hand, which guarantees their being in their places for the entire period of wearing the cross. Such a cross can be a variant of an office cross.